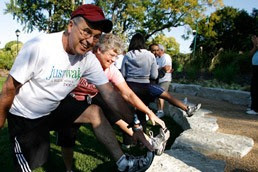 Created in 2005 by Dr. David Sabgir, Walk with a Doc aims to "encourage healthy physical activity in people of all ages, and reverse the consequences of a sedentary lifestyle in order to improve the health and well-being of the country." The idea is simple: each weekend people meet at a set location for a short walk with a local physician. Not only does it promote physical activity, it also provides an informal way for people to talk with a doctor about their medical concerns. Check out the list of locations to find out if there's a walk happening near you.